We're having computer issues. Nothing is working properly. I can write a post, but can't upload photos without everything crashing. I've been trying to get today's outfit up for the past hour and I'm getting frustrated and annoyed. Our computer guy is on vacation until the weekend, so I may not be able to get any of my outfits up for several days. I will still be taking pictures...but until things are fixed, I am not able to post. Okay, it's a stretch, but when "fingertip" jackets were last in style (oh, around 1999), Scully wore them on "The X-Files" and I worked the bob haircut back then and fancied that I looked like her. Woo, I should have brushed my hair, haha! Looking a little unkempt from my walk home. This outfit was built around the shoes, which are Ralph Lauren, which I got for only $40 in a consignment shop on Saturday. Barely worn! What a steal! Of course, I love this skirt, and now that I can go bare-legged, I don't have that clinging problem anymore. 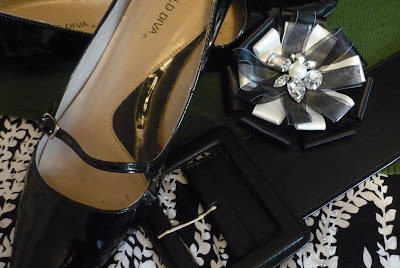 Dark grey patent with black grosgrain trim and a black heel. The earrings are new too. Jacket (Ricki's), top (Lady Dutch), skirt (Le Chateau), shoes (Ralph Lauren, consignment), earrings (Jones New York). This is the same outfit I wore on Saturday to go shopping, only I wore flats then, and my jean jacket. I liked it so much, I'm wearing it again, only with the new (to me) shoes I bought and a jacket. I wore the jacket only a little bit, as I was (finally) warm enough in my thin sweater. 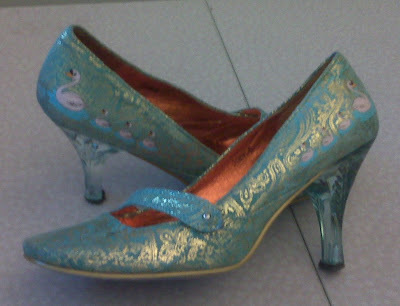 Picked up the shoes at a thrift store where profits go to women in need. 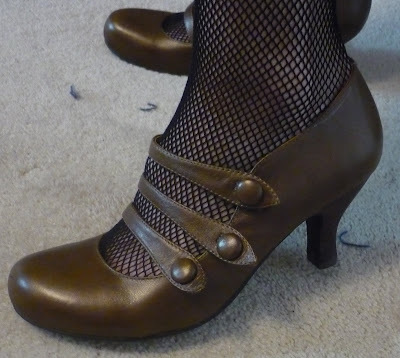 The shoes are Fioni, which I think is one of Payless' lines - they were barely worn and were only $12. I liked it so much, I bought one for Daisy for her birthday. 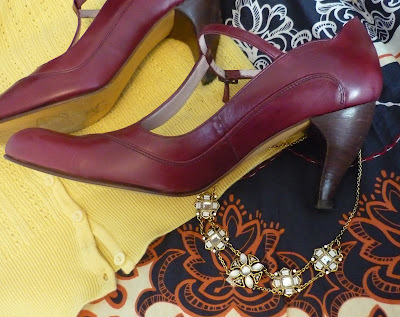 Jacket (RW & Co.), sweater (Plum), skirt (Odd Molly, consignment), shoes (Fioni, thrifted), white gold hoop earrings and ring. My standard race gear for races. And here I am at the end, exhausted. Whew! My time wasn't as good as last year's (which was 1 hour and 7 minutes), but at 1 hour 14 minutes, I'm still pretty happy with it. I'm sure I'll be sore tomorrow. Just so you know, I WALKED the race - I race walk (yes, that silly thing with the hip wiggle). I think I won a silver medal. I'll find out in the next couple of days (results weren't ready, as they had to review the course monitors' notes and disqualify people who ran in the Competitive Walk category - the monitors record the numbers of anyone wearing a pink number who is running, and bump them into the Running category. My wonderful bubble-hemmed skirt that I wore on Christmas gets a lighter look with the black fitted top last seen in the outfit that I wore to Alice Cooper. Add the gold sandals and a big chunky pearl necklace and we're good to go. Not much bling (I wore a ring and stud earrings) as the skirt is pretty blingy on its own. 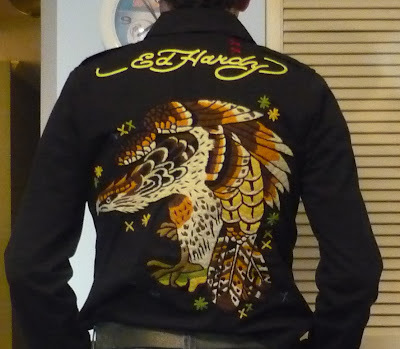 A shot of the back of the shirt (that's all embroidered in wool). Oh my god, I want! Top (Le Chateau), skirt (Kenzie), shoes (Guess), necklace (Aldo accessories), ring (not shown, Expressions), crystal studd earrings. I mostly had a craptastic week. One of the few highlights was that I got to see Leonard Cohen in concert. He's 74 years old, and it will likely be his last tour. Every song was so emotionally loaded with the knowledge that here's someone who's had a 40+ year career; you could see his gratitude and thankfulness. His words touch you. When he sang "Hallelujah", "Bird on a Wire" and "Famous Blue Raincoat" I cried. If you are not familiar with this amazing poet and songwriter, you are missing out - do yourself a favour and download some of his music for your iPods here. I recommend "The Future" (the whole album), "I'm Your Man" (everything but "Jazz Police") and "Cohen Live" ('94) (all of it). Anyway, long story short, I got a t-shirt at the concert and I really love it, so I planned today's outfit around it. "Beautiful Losers" is a book by Leonard Cohen. I have not read it (I probably should get it), but I was totally drawn to the name, because it reminds me to celebrate my 2 year anniversary of maintaining my goal weight loss of 50 pounds, and give a shout out to all the people who are working so hard to get healthy - you can do it! Here's to all of us Beautiful Losers! Anyway, I'm rambling again. I liked how this turned out kind of mod, especially when I added the hat. I like the mix of all the neutrals with the white, and the multiple patterns and textures - I just love that cashmere stripey top. I am glad I added all the necklaces. 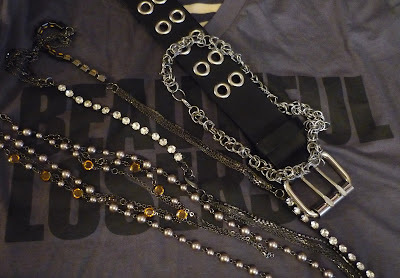 I like to wear my chainmail necklace and the grommet belt when I'm doing the rocker-inspired look. The addition of the sparkly necklaces helped soften it. This weekend: party at Daisy's! And the big 10K race (edited to add: I racewalk it)! Striped top (Majestic, from Caro), t-shirt (L. Cohen concert), skirt (Club Monaco, consignment), tights (Hue), boots (Cougar), belt (gift from Ruth), hat (Deluxe), chainmail necklace (handmade), rhinestone necklace (Jacob), triple necklace (Plum), white gold hoops. Swing and a Miss - And Special Guest Shoes! Announcement: I've added a bunch of links on the right side to some posts about me (because I'm full of myself that way, haha); things like my weight loss, or my closet, in case you're interested. They're posts I like. Anyway. I really thought this outfit would look okay. But when I put it on at work (see, I don't try on my clothes the night before, I just pick out outfits and cross my fingers), I was all, "Ugh, this doesn't work. Dang." I got my hair cut after work, which is why I'm doing the "check it out" pose. I think a belt would have been better for waist definition. This skirt is just so pouffy. The fab Fluevogs make another appearance. Special Guest Shoe from Ruth! 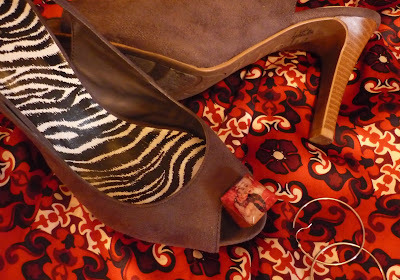 My second pair of Irregular Choices -- These are the first shoes I saw when I walked into the Schuh store. Oh MY. I adore purple and I love the iridescent glow of these shoes. Unfortunately, I was having nail issues and had to take them off half way through the day and put on my flats. Speaking of flats, I noticed when in London that the majority of women were wearing flats--either ballet flats or boots, but always nice ones. Probably because everyone walks/takes the tube. The only time I saw someone in trainers was at the gym. Mind the gap, ladies, especially in heels! Cardigan (no label, consignment), cami (InWear), skirt (no label, thifted), shoes (Fluevog), necklace (Le Chateau), rhinestone stud earrings. It's my award for still having a job. I actually like it with this skirt; the skirt's a bold pattern which helps to balance the rosette. I'm trying to wear semi-sensible shoes this week, since there's a big 10K race on Sunday. Sweater (Max Studio), skirt (Tommy Hilfigger), cami (InWear), belt (no brand), shoes (Wild Diva), rosette pin (White House/Black Market, gift from Mom), crystal stud earrings. Finally, I feel like spring is here! I'm gravitating towards all my lighter clothes, both in colour and texture. I'm going to have to clean out the closet soon and pull out all my summer shoes from storage. Londyn, you probably recognize this blouse - we have the same one. It's such a light silk, I can only wear it when it's really warm out. Love the shoes - my first wear of them in months. Ah, all that glorious colour! Yellow! Oooooh....aaaahhhh! Blackberries are lousy cameras, sorry. Here's what Princess Nicole has to say about these: "I bought these shoes in downtown Dublin at my favorite European shoe store: Schuh. I fell in love immediately with the gold brocade effect, the family of swans and most importantly, the "glass heel"- so reminiscent of Cinderella! 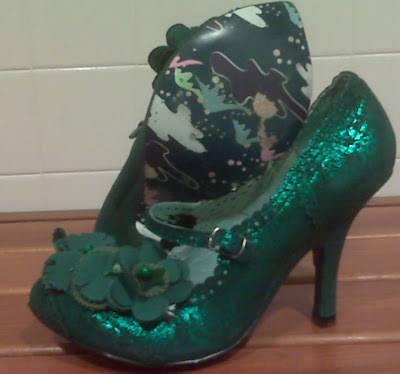 I can't help but feel decadent when I wear these shoes…"
Of course, they are Irregular Choice (again). Why do I not have a pair of them?? Blouse (Nine West), jacket (RW & Co.), skirt (Le Chateau), belt (Plum), shoes (Qupid). Nothing terribly exciting. I got this blouse at H&M in NYC (near Times Square) - it always kind of bugs me that it's a size 10. Man, sizes are just screwy. The weather has been absolutely gorgeous, so I've busted out the self tanner (I like Olay's) and I'm trying to ensure that I don't get white lines from my socks. Anyway, bare legs! Yay! I also note that my hair is getting to the length where it starts to do a flip. I kind of like that look on me - I've done it a few times. I'm getting my hair cut on Thursday, but probably just a trim. I really like these sandals. 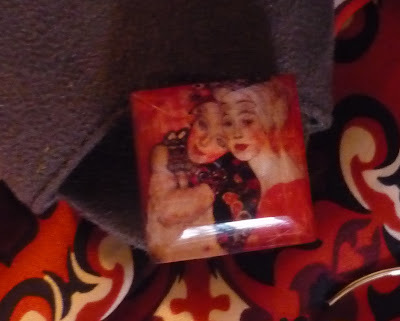 I bought them ages ago (I think of them as one of the items from my Fat Days - I didn't keep much from then), and forgot I owned them until last year. Standard black accessories and wee, I'm done. 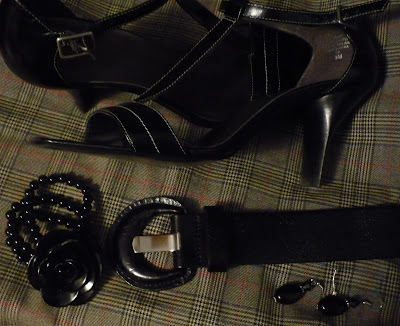 Blouse (H&M), skirt (Jacob, consignment), belt (Plum), bracelet (Le Chateau), earrings (the Cobbler). Ah, Friday. How happy I am that you are here. I chipped one of my front teeth earlier this week, so I had to go to the dentist today and have it fixed. Man, I hate dentists (I knocked out two of my front teeth when I was 17, so I have a lot of lingering trauma from all the work that was done on my mouth. Nine months of dental work...eee...). No offense to my dentist. I have gotten a lot of mileage out of this dress. It's so comfy. Another appearance by the wedge heel boots. Mom's choker, my cut-out leather belt and my bigass gold hoops. Dress (Ricki's), cami (InWear), belt (Plum), boots (Outline, consignment), choker (70s vintage, Mom's), earrings (gift from L). 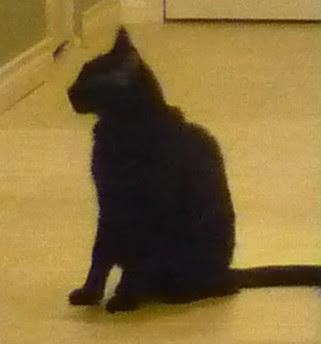 For those of you who can't see detail in my pictures, I am sorry - the lighting in my house is not the greatest and when I use the flash on my camera, I hate the way it looks (all glare-y). If you haven't noticed, my "stuff" background is nearly always one of the articles of clothing (yesterday's was the skirt some of you couldn't see very well in the full shot). They go right up the sides of both legs. Fun! Vintage flexible gold cuff (filched from Mom's jewelry box around 1984), and my Avon filigree earrings. The JLo shoes keep everything grounded in 2009. Very Emerald City. 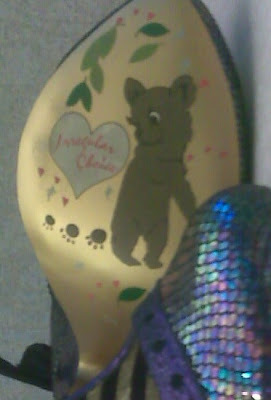 Ruth says, "Irregular Choice, probably my favourite shoe brand. Yes, even over Fluevog, but by a very slim margin. Someone has actually put some thought into these shoes. Some imagination! 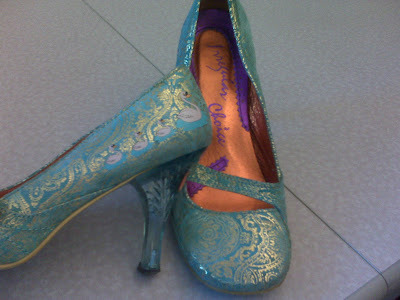 These shoes are not only a fabulous iridescent colour, but extremely comfortable. I love the soles and I loved the box they came in so much I brought two home in my suitcase (yes, I have another pair of [possibly even more amazing] Irregular Choice shoes waiting in the wings) -- I use really good shoe boxes to store accessories etc in my closet and these are fab pull-out boxes with a reinforced finger hole (not the boring top-lid type). And they've got little robots on them :) Doesn't get much better than that." She also notes that someone wrote on the box, "Sorry. I love you X." He looks furious. I'd better feed him. Cardigan (Vero Moda), top ("Style Rite Blouse Co.", vintage), skirt (Kensie), shoes (JLo), bracelet (Mom's, vintage), earrings (Avon). Okay, don't say you weren't warned. Ahead lies pictures of me in pink, miniature gods and shoes so gorgeous I nearly rubbed them on my face (hey, they were new! they had that "new shoe" smell still!). It's a long post, I'm just sayin'. Blurry pictures from Blackberries, notwithstanding, those are some shoes. 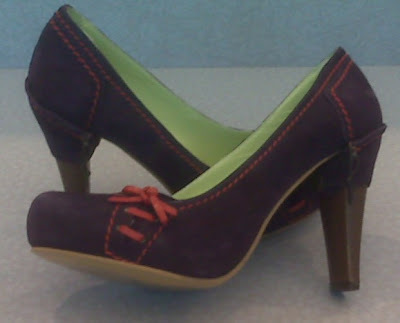 Purple suede with red stitching and laces, lime lining (! 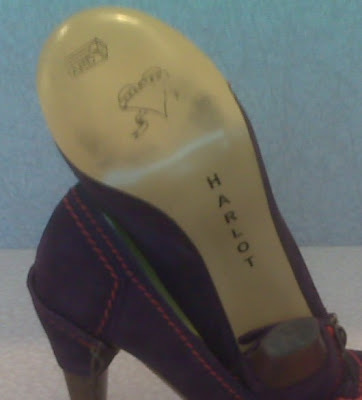 ), the wrapped heel, oh my goodness. I think I have the vapours. I was surely in a girly mood today. Pink and everything. 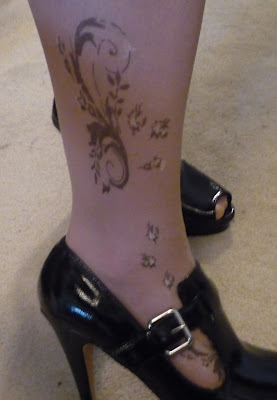 How I transition into Spring: I stop wearing tights and hose and wear my boots with my summery lighter weight skirts. The cotton lining creeps up when I wear it with tights, but it works great with boots and bare legs when it's warmer out. I love this skirt. It's dusty rose cotton under the brown netting with burgundy and pink embroidery on the hem and the wide waistband (I'm not showing the waistband because the skirt is about 2 sizes too big on me; it's sitting on my hips). 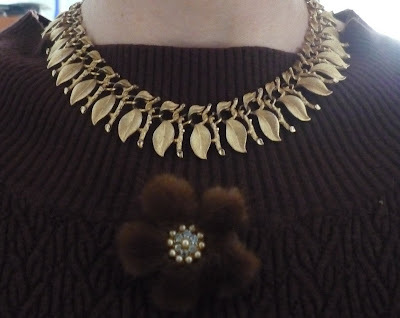 I love the feel of the necklace, and I petted the brooch all day. I haven't worn these boots enough this winter. They're quite thin so they are really better suited for Fall and Spring. 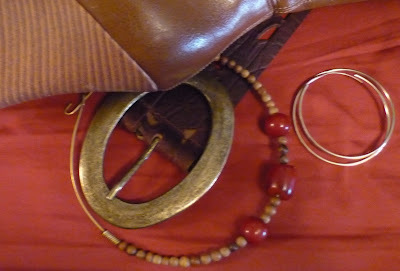 Grandma J's bracelet as well (also from the 50s). And now, something rather different. 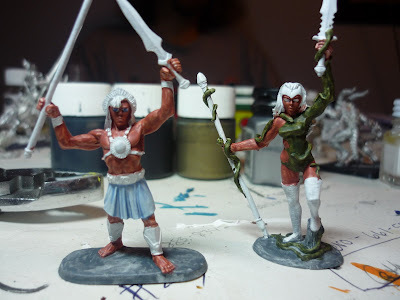 I've finished another figure - it has been a long time! I had nearly forgotten that I painted! I hate this stage - it seems so far to get to the end and all the details. I put in close to 4 hours work to get from the last picture to the end result. There was at least one painting session between this one and the next that I don't seem to have documented. "I am a very silly-looking god. I hold my weapons poorly." "And I am a god in an uncomfortable leotard." He kind of looks like an extra from the "Rocky Horror Picture Show." 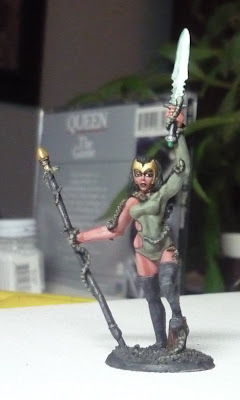 I like her better, but I always like painting women more than men. 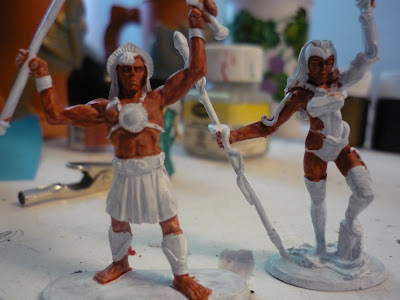 These are supposed to be vaguely Egyptian. 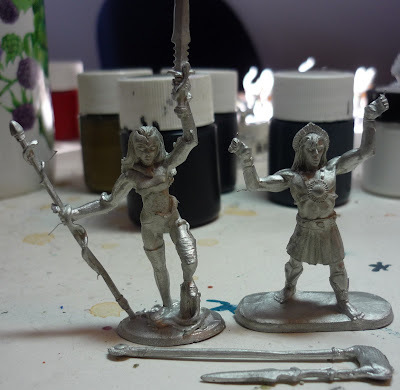 I don't know why I bought them, but they had me in the worst case of painter's block ever! 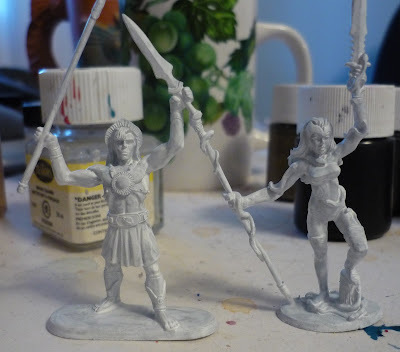 I finished these on Monday, nine months after I started. Oh, wait. They want to show you their bums. See what I mean about the uncomfortable leotard? 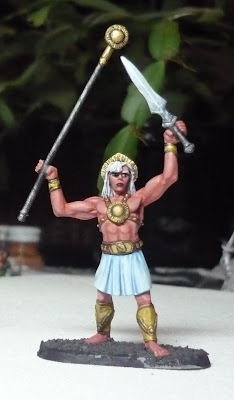 I did a good job on his skirt, though. 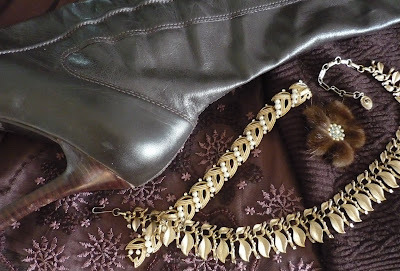 Sweater (no label, consignment), skirt (RW & Co.), boots (Roberto Vianni), necklace (Listner, vintage, Grandma J), bracelet (Trifari, vintage, Grandma J), brooch (vintage). Office Uniform and Level 2 Beginner Achieved!